My mother has only one exact match. Then she has 220 matches at a genetic distance of 1. I know one of those matches and had her check--she has 219 exact matches, so my mother's 220 matches at a genetic distance of 1 are all perfect matches to one another. 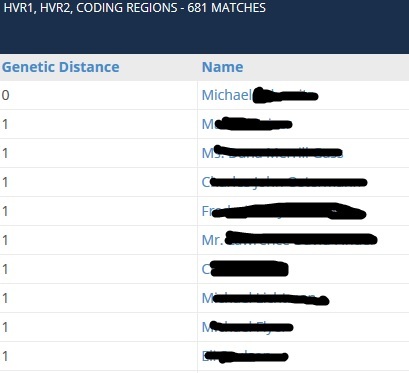 It seems like my mother and Michael share a relatively recent common female ancestor who had a specific mtDNA mutation which split them off from the other 220. I reached out to Michael, explaining that my mother's direct female line came from what was then the Maramaros area of Hungary, currently on the Ukraine/Romania border and giving him names back to my 4th great grandmother. And he responded, "My maternal grandparents came from Maramaros region of Hungary. The family name was H***. I would like to (see) any connection you find." I asked for more information about his family--which he forwarded to his cousin Robert, and from whom I got a reply. Robert is currently in Africa on business (he and I apparently share travel-bug genes, so there must be some sort of close connection), and his genealogy information (including the maiden name of his & Michael's mutual grandmother) is back in the US. However, he knew the town that his grandfather (and possibly grandmother) came from, which is less than 10 miles from my family's towns. Meanwhile, Michael has ordered a FamilyFinder which is being processed, and Robert will do so as well when he is back in the US. Those autosomal tests' results should help to figure out how far back we are related, and then I'll work to find the paper trail to back things up. That's fantastic!! I had my mtdna done, but no break throughs yet. Thanks for giving me hope! Never give up. And you never know when that magical match will test either. Wow! You may really be on to something!